Walbristar YuccaEvergreen succulent shrub. Slowly forms a short trunk. Needle-pointed short gray-gre..
Variegated Adam's NeedleEvergreen shrub. Slow growth. Creamy golden leaves with bright green edges. ..
Our Lord's CandleEvergreen shrub. California native. Dense, trunkless rosette form. Leaves are gray-..
Spanish BayonetEvergreen shrub. Green, sword-like foliage with a dusky purple blush. Leaves are tipp..
Adam's NeedleEvergreen shrub. Slow growth. Rigid, sword-shaped, spine-tipped green leaves with long ..
Adam's NeedleEvergreen shrub. Slow growth. Green leaves with bright golden yellow edges. From early ..
Adam's NeedleEvergreen shrub. Slow growth. Gold-centered variegated form of yucca. Rigid, sword shap..
Adam's NeedleEvergreen shrub. Slow growth. Green leaves with creamy yellow edges. From early to mid ..
Ivory Tower YuccaEvergreen shrub. Slow growth. Sword-like leaves are topped by tall spikes of ivory ..
YuccaEvergreen shrub. Slow growth. 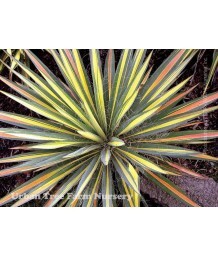 Green and bright yellow striped sword-like leaves are topped by t..
Spanish Dagger, Soft-tip YuccaEvergreen shrub. 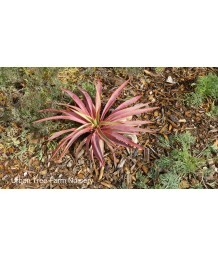 bears sword-like leaves to 24 inches long in shades o..
Spanish Dagger/Soft Tip Yucca/Variegata Mound LilyEvergreen shrub. Variegated green and cream lance-..
Blue YuccaEvergreen succulent shrub. Slow growing but will develop a trunk with time. Narrow, tough,..